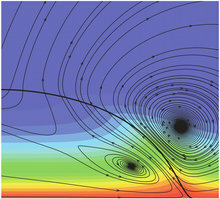 Computational methods have been extended recently to allow for the presence of moving contact lines in simulated two-phase flows. The predictive capability offered by these methods is potentially large, joining theoretical and experimental methods. Several challenges rather unique to this area need to be overcome, however, notably regarding the conditions near a moving contact line and the very large separation of length scales in these flows. We first summarize the main models for moving contact lines and follow with an overview of computational methods that includes direct continuum approaches and macroscale models that resolve only the large-scale flow by modeling the effects of the conditions near the contact line using theory. Results are presented for contact-line motion on ideal as well as patterned and grooved surfaces and for extensions to account for complexities such as thermocapillarity and phase change.